Celltech was started in 1984 by an entrepreneurial Swede with a passion for power – battery power, that is. At a time lithium ion was all the rage, we became experts at it. That marked the beginnings of an intense period of development in our industry. The world of power supply has continued to change rapidly ever since – and so has our expertise. In 30 years we have gone from being a small, local battery company to an international player with locations in Sweden, Norway, Denmark and Finland, and customers across the Nordic region and beyond. We are now under the ownership of Addtech AB, which is listed on the Stockholm stock exchange. Addtech has been in business more than one hundred years, and its backing provides Celltech with stability and additional experience. Celltech has also broadened production capacity with partners in Sweden and in China. And thanks to collaborations with our sister companies within Addtech, we continue to make contributions to the power industry. 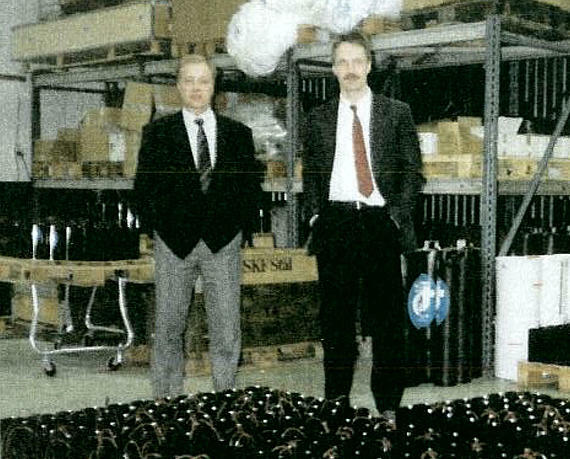 Åke Darfeldt (to the right) together with Swedish Defence Materiel Administration (FMV) representative inspecting the first delivery of batteries from Celltech to the Swedish Defence in 1984. Celltech is the leading battery supplier in Nordic region. Together with our customers we develop power solutions for a wide range of applications - from standard off-the-shelf products to customized solutions.